This proposal of a special track is the offspring of the SIG WELL (http://ea-tel.eu/special-interest-groups/well/) in the context of the European Association for Technology Enhanced Learning (EATEL). It is a follow up proposal for the inaugural session we had at the iLRN 2015 in Prague. 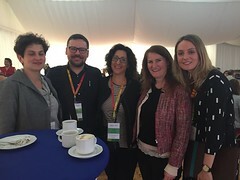 In the meantime, the SIG was successful in organising a number of similar events at major research conferences and business oriented fairs like the EC-TEL, the I-KNOW and the Online Educa Berlin OEB. Moreover, the SIG has involved in securing substantial research funds through the H2020 project WEKIT (www.wekit.eu). The SIG would like to use the opportunity to present itself as a platform for scientific and industrial knowledge exchange. EATEL and major EU research projects and networks in the field support it. Moreover, we’ll seek to attach an IEEE standard association community meeting of the working group on Augmented Reality Learning Experience Models (IEEE ARLEM). I am coordinating the project “Digital Future” at Beuth University in Berlin founded by the Stifterverband in which we develop strategies for the use of digital media in every department in 2016 and then a university-wide strategy in 2017 based on the department-strategies. One of the key approaches in this project is Open Innovation, in which we focus on bringing in different stakeholders and different perspectives together. Each department has already appointed a digitalisation representative who together with a strategy-team with representatives of different stakeholder-groups from a given department (including professors, students, alumni, researchers, program directors, lab directors etc.) drive the development of the digital strategy in the respective department. Not long ago I presented our strategy development process at the Workshop on e-Learning with the focus on digital representatives as change agents. You can see my slides below. Are you involved in a similar process or can point me to an higher education organisation developing digital strategies? If yes, I’d be glad to receive your comment and share ideas and lessons learned! We started the Special Interest Group on Wearable Enhanced Learning together with Ralf Klamma from RWTH Aachen und Fridolin Wild from Oxford Brookes University only in 2015. The interest in wearable enhanced learning has been growing rapidly. This year, at EC-TEL 2016 in Lyon France, we have organised already the 4th SIG WELL workshop!